Buying Panel Systems furniture saves you time for more important things. When you purchase systems furniture at Panel Systems Unlimited, we respect the fact that you need time for your real job. Time is money and our professionals at Panel Systems Unlimited will save you both by actually helping you buy used commercial office furniture. During the selection process, our skilled CAD experts take your space and design an attractive and functional floor plan. Once the order is placed, we step in and work out all of the details with your building’s subcontractors prior to installation. 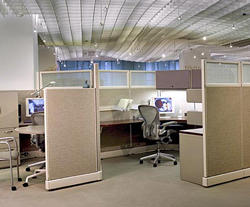 This process makes the decision to buy used office furniture from Panel Systems Unlimited an easy one and lets you get back to your busy schedule, giving your time back to you. If you’re on a short time frame, we can make your installation very quick with most of our customers having their systems furniture installed within 5-10 working days. Plan your systems furniture now for even greater savings. Whether you need your used systems furniture in a week or sometime next year, let the experts at Panel Systems Unlimited put time, and savings on your side. Unlike the time it takes to order designer office furniture, many of our customers require quick service and we are always ready to put a design team on the fast track. However, if time allows, you might find it useful to plan your purchase in advance allowing yourself greater customization options and even more flexible pricing. People who commit to buy used office furniture systems from us several months before they need their modular office furniture installation completed receive the most comprehensive services, product options and savings on commercial office furniture available anywhere. At Panel Systems Unlimited, we make your time work for you. We serve businesses in Atlanta, Louisville, Birmingham, Memphis, Charlotte, Knoxville, Raleigh, Columbia, Tampa, Augusta, and all other cities nationwide.